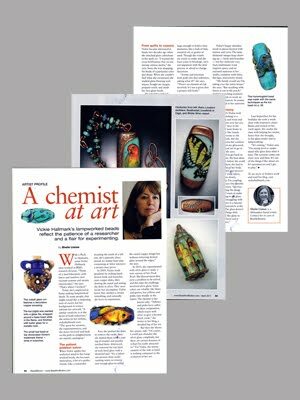 I was thrilled to be approached last fall by editor Ann Dee Allen of Bead & Button Magazine regarding a profile of my glass work. Sheila Llanas interviewed me several times via phone and e-mail, and I shipped some representative beads and vessels to her to inspire her writing. Finally the wait has passed and I can announce that the profile has appeared in print, in the April issue of Bead & Button. Sheila did a terrific job of distilling my scientific background and experimental approach to art into background for the article. The photographers at B&B also took advantage of the beads and vessels I sent, along with my own images, and a bead from the editor's collection to illustrate the article. Quick, run out and find the latest issue, which has a beautiful bangle project by Cynthia Rutledge along with other fun bead projects. Congratulations Vickie! It is a well deserved honor and recognition, as your creations are always original and YOU-nique! Your love of glass and jewelry design shows in all you do!